The veggies are not present because I was in a rush going through line, but they were given to the students. I think it would have been peas. Today there’s an additional little sauce for the chicken nuggets! I wonder what the kids think when the sauce shows up since usually they get bbq sauce. Also the packaging changed from small reinforced paper containers to actual plastic similar to a microwave meal. I know that normally ovens are used to heat up the food, but I wonder if this meal was microwaved? I just can’t really imagine that. The apple was delicious and the garlic bread was good, a little chewy. And the chicken nuggets were “eh.” Knowing that they could be only 30% to 50% chicken makes it harder for me to eat them. I’m fixated on the fillers. Today I would have loved some hearty chicken noodle soup. Man, I wish I could take a break. Previous PostGuest blogger: Food service director on "Thaw-and-serve"Next PostBecome a School Food Lobbyist on April 21! Oh you are so brave, Mrs. Q. After seeing how chicken nuggets were made on Jamie Oliver's food revolution, I don't think I'll ever eat one again. I am addicted to your blog. I find it ironic that the side of the container says "Food for Thought!" There are so many changes that need to be made to promote a healthier school lunch and provide brain fuel for learning and development. 50-80% fillers does not qualify!!! That is such a small amount of food for a meal. Even with the peas, it just seems small. I would be hungry an hour later. Hang in there, Mrs. Q. Summer's coming! Have you seen the new commercials by ameribev.org? Soda companies have taken full calorie sodas out of schools, "reducing calorie intake from beverages by 88%." This is a good thing. Keep the conversation going! Most TV dinners come in plastic trays that can be put in the oven. I highly doubt your meal was microwaved. Thanks anonymous. I forgot that many tv dinners can be baked in an oven. I can't conjure up an image of the lunch staff microwaving hundreds of those containers anyway. @rebranded–That just means the kids are being given artificial sweeteners. 🙁 No better in my book. After watching Jamie Oliver's chicken nugget demonstration, I have come to think of the things as sausage. Cheap sausage, but still, the concept is similar. Wait, is that large brown thing in the package the garlic bread? I totally thought it was a baked potato (for which I totally would have given the lunch crew props)- although that did make the statement about forgotten veggies confusing. It even inspired me to pack a baked yam for lunch! Yep, my Weight Watchers "Smart Ones" Salisbury Steak lunch came in similar packaging, and has conventional oven directions on the side: 350 degrees, 45 minutes. Yes, yes, this means I'm eating something that looks very much like the kid's lunch. It's high in sodium (31% Daily Value) and full of Textured Vegetable Protein and Hydrolyzed Vegetable Protein. It's cheap, fast, and fulfills my goal this week: make counting my Weight Watchers Points easier. It looks like school lunches have fallen back on the same crutch. I cannot even imagine how much trash flows out of your school cafeteria — and others — with this much packaging for one lunch. You must be just as eager for a real plate, cutlery, and napkins as you are for real food! What was the nugget sauce? Marinara? BBQ? Unknown origin? If I could manage to choke it down…it sure did not look like a lot of food. I agree with you on the nuggets…I cannot get past the fillers. It is a little crazy that the containers are plastic..they will be in a landfill for ever! I'm dying to know what the sauce is. or do i not even want to know? they was grilled cheese offered at my school today. was there tomato soup anywhere to be found? nope. After I came across your blog maybe 2 months ago, I wish I was in high school all over again. I would totally join you! I also told one my teachers who also teaches in the school district since she sends her children to school too. Anyways, don't take a break! Imagine all the children who wishes they could take a break, those that do, (I was one of them), would begin to pick at the food and only eat bits and pieces of it. I am so glad that you're doing this. Also, I think after this one year is passed, maybe think about what you did and maybe take it another step up. You can bring awareness of how important it is for students to have a healthy hot meal from school if it is not provided at home. I went to a 4th grade breakfast for the parents a few weeks ago at my daughter's school. Here are my thoughts- The cafe is small and they have fruit and veges painted on one wall, a ocean mural on one,poster of flavored milk, and one one wall on a shelf is paper mache' sodas and chips!!!! about 20 of them!! That really got to me. For breakfast we had scrambled eggs (the pre made egg in a bag stuff, I'm pretty sure), sagause, blueberry muffin, milk (5 kinds, 3 are flavored)thankful my daughter like skim milk, apple or orange, and apple cider. Food was good, not eggs- too much food and I didn't even have juice and fruit.I was happy to see that the school recycles the milk and juice containers (has kids empty them in bucket) and plastic silverware. I will still be making my daughter's lunches next year. I wanted to tell you about the article on Yahoo this morning. 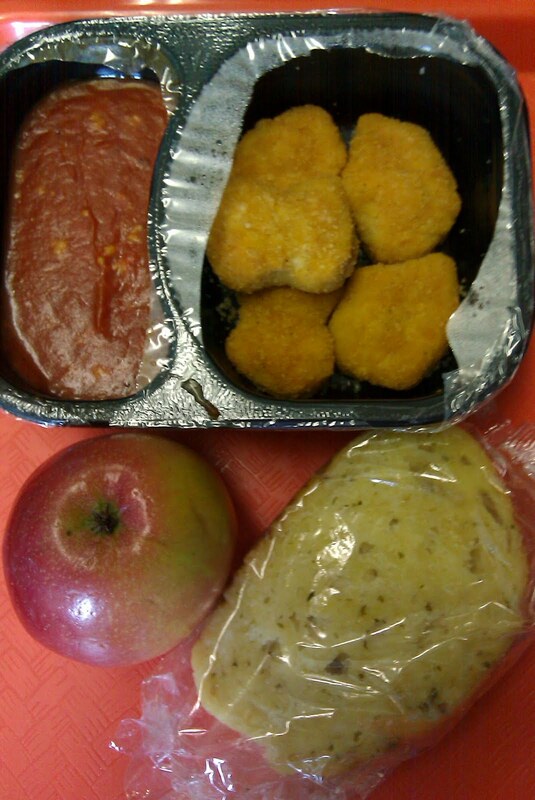 It is about how the mililtary is concerned that school lunches are making children to obese to enlist.